This week we’ll be going all out on Scientology, what with the ANON war going down, we feel it’s in the spirit of things..
By all appearances, Noah Lottick of Kingston, Pa., had been a normal, happy 24-year-old who was looking for his place in the world. On the day last June when his parents drove to New York City to claim his body, they were nearly catatonic with grief. The young Russian-studies scholar had jumped from a 10th-floor window of the Milford Plaza Hotel and bounced off the hood of a stretch limousine. When the police arrived, his fingers were still clutching $171 in cash, virtually the only money he hadn’t yet turned over to the Church of Scientology, the self-help “philosophy” group he had discovered just seven months earlier. His death inspired his father Edward, a physician, to start his own investigation of the church. “We thought Scientology was something like Dale Carnegie,” Lottick says. “I now believe it’s a school for psychopaths. Their so-called therapies are manipulations. They take the best and brightest people and destroy them.” The Lotticks want to sue the church for contributing to their son’s death, but the prospect has them frightened. For nearly 40 years, the big business of Scientology has shielded itself exquisitely behind the First Amendment as well as a battery of high-priced criminal lawyers and shady private detectives. 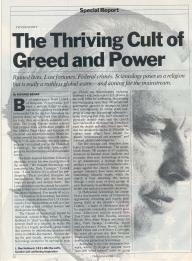 Yet the outrage and litigation have failed to squelch Scientology. The group, which boasts 700 centers in 65 countries, threatens to become more insidious and pervasive than ever. Scientology is trying to go mainstream, a strategy that has sparked a renewed law-enforcement campaign against the church. Many of the group’s followers have been accused of committing financial scams, while the church is busy attracting the unwary through a wide array of front groups in such businesses as publishing, consulting, health care and even remedial education.